The specified file public://inline-images/http_%2F%2Fcom.ft_.imagepublish.upp-prod-us.s3.amazonaws (1)_0.png could not be moved/copied because no file by that name exists. Please check that you supplied the correct filename. 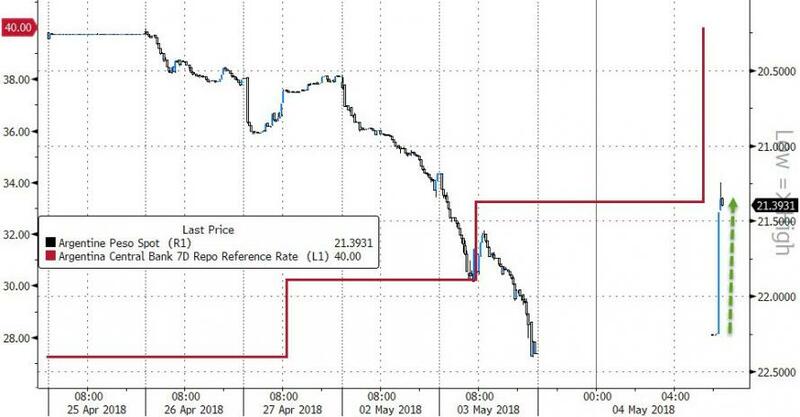 The Central Bank of Argentina (BCRA) just hiked its 7-day repo reference rate to 40.00% - up a stunning 1275bps in a week - in a desperate attempt to stall the collapse of the peso (and ARG bonds) this week. The central bank said it will continue to use all tools at its disposal to avoid disruptions in the markets and guarantee a slowdown in inflation. The bank is ready to act again if necessary, it said in the statement. As The FT reports, appetite for Argentine assets has been waning in recent months as concerns grow over the country’s painfully high level of inflation and large trade and fiscal deficits. A severe drought is also complicating President Mauricio Macri’s efforts to revive Latin America’s third-largest economy. Agricultural exports are one of Argentina’s main sources of hard currency, but the worst drought in decades is expected to hit this year’s soybean and corn harvests. The country’s famed cattle industry is also predicted to rack up millions in losses. And, of course, adding to Argentina’s woes is the return of US dollar strength. The peso has now plunged over 17% this year against the dollar, and plunged yesterday by the most since it began its free-float in December 2015. ARS is very modestly stronger as it opens this morning after the hike. 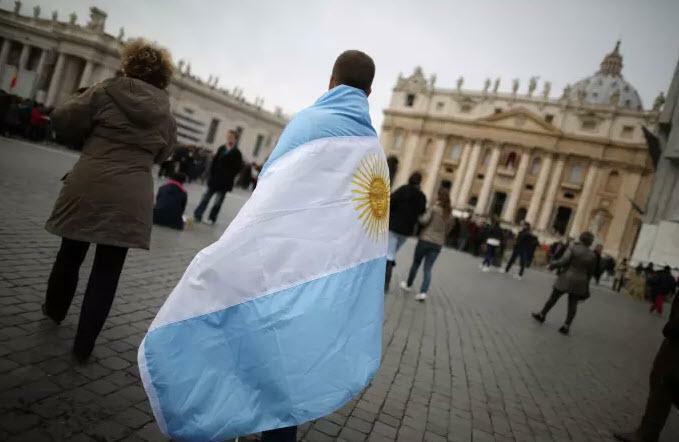 As we said at the time of issuance, while the bond was massively oversubscribed, investors questioned the wisdom of investing for a such a long term in a country as volatile as Argentina. 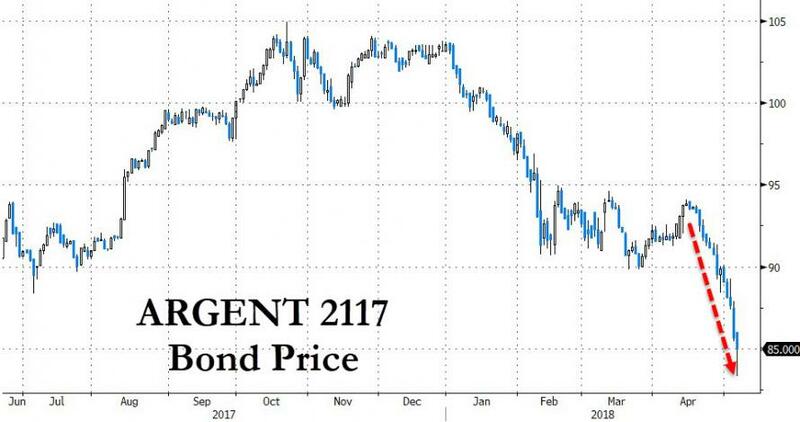 "It's awfully premature for Argentina to issue 100-year bonds," said Jorge Piedrahita, chief executive officer of Puma Investments. "When you look back in history, I'm not sure we can find a 20-year period where Argentina has not defaulted." That bridge will be crossed in due course, meanwhile aside from the government, the biggest winners were Citigroup Inc and HSBC, who acted as lead book runners on the deal. That bridge may just about to be burned once again. Argentina's Treasury Secretary Dujovne is attempting to stabilize the narrative, stating alongside Finance Minister Caputo that the central bank's actions are meant to address volatility and reaffirms the government's commitment to tighten fiscal policy (which many have doubted). Dujovne warns "we can't go on living on borrowings" saying that the country's fiscal deficit target will change to 4.9% of GDP, and warned that the rate-hikes may impact economic activity and "May inflation may be higher than expected." Dujovne also spun the following narrative - that the plunge in the peso "isn't a reflection of local issues" but is "due to external factors." 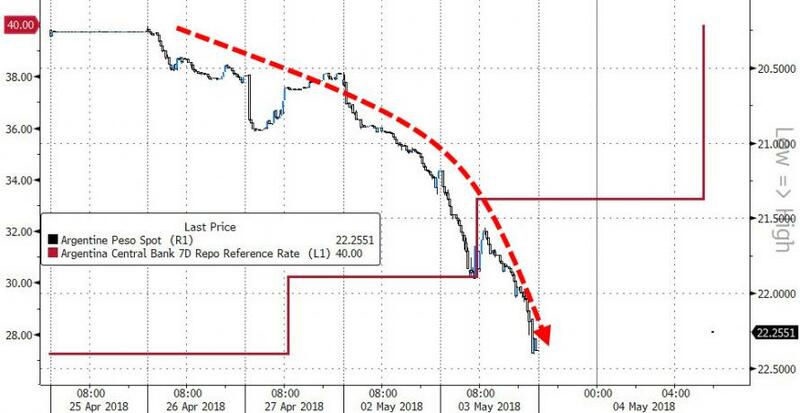 Caputo claims that Argentina "wasn't caught unaware by the market" but a 1275bps hike in a week suggests they were! However, as The FT concludes, for Argentina, cooling demand for its bonds can potentially become problematic because it needs to continue issuing hard currency debt to finance its fiscal deficits. 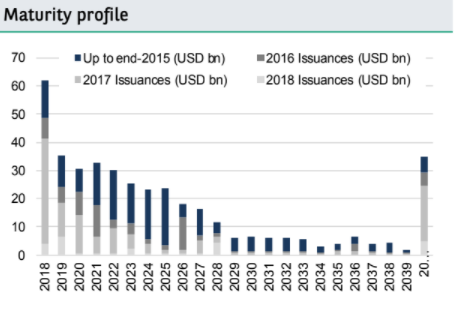 The country has already raised $17.6bn so far this year via hard and local currency bonds as this chart from BNP Paribas illustrates. The alarm signal went off well before December 2001, when the lorries hired by the banks began to come to Ezeiza in the middle of the night to flee abroad the dollars they had accumulated after years of financial operations. As happened so many times throughout history, they were the first to notice that the country was dangerously close to an apocalyptic end. A few months later, the country exploded.